Here we are again, at the start of spring and staring at all the potential around us! The weather is glorious and our schedules are beginning to fill with all the activities and priorities that come with a new season! This time of year is a time of new potential in so many areas, and to meet that need planner companies are rolling out new planners full of different cover designs and features that are paper tools to help us meet our days. 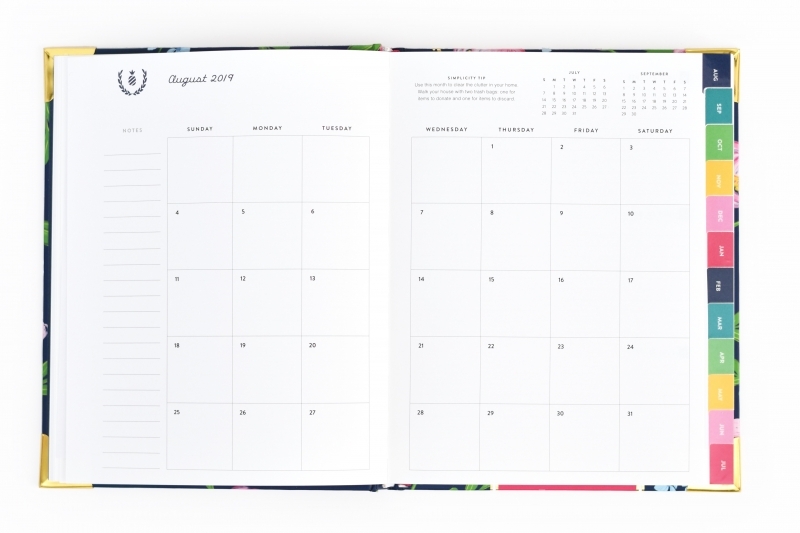 There is nothing magical in a planner – not in any planner! Like any tool, they require the worker’s hands, mind, and heart to carve out of them a work that reflects the beauty of a given day. There is beauty in the full day of the mom at home with 3 littles all under the age of 6. There is beauty in the day of the single mom who is doing her absolute best to love into every moment of her kids’ lives. There is beauty in the day of the young woman who works all day! And there is beauty in the day of the retired woman whose children may be grown. In each of these seasons, God’s grace transforms our ordinary into something quite extraordinary, and that beauty is not to be missed! The internet is so full of images and inspiration that it can be tempting to think that there is more beauty in a space seen online than you see in your space. But, I am here to tell you that there is more beauty in your pile of laundry and the ketchup smudge on your 5 year old’s face than you can see! There is distinct and unmistakable beauty in every season of life, and as long as we live the season we are in with our very best, serving and loving into all the ketchup smudged moments, the beauty in those small things will be apparent! What in the world does all this have to do with a planner? Perhaps more than you might first consider! Consider yourself a woodworker for a moment, and that planner is your block of wood to carve. There are so many blocks of wood to choose from in the planner world – choose well. You want a block that will be malleable enough to bend with you – regardless of your season of life – beautiful and inspiring, and simple so that when you begin to carve you are not overwhelmed by extraneous forces. 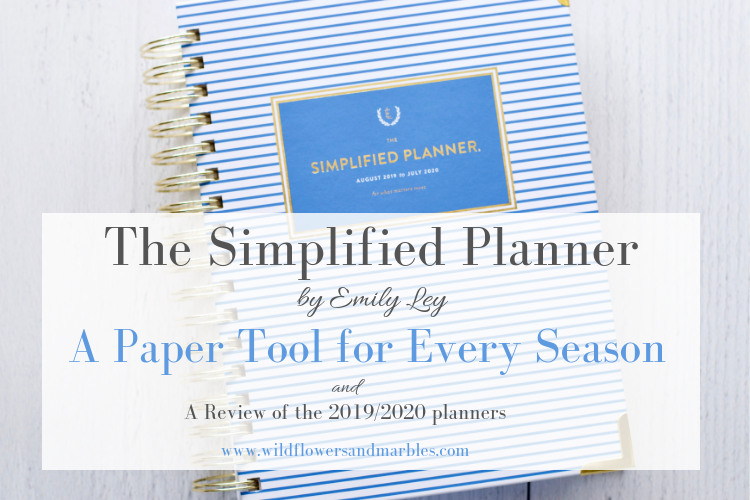 I’ve seen and touched a lot of different planners, and there are so many that work well for different people with different needs, but I’ve only found one planner that meets any need, for any woman, in any season of life – The Simplified Planner. 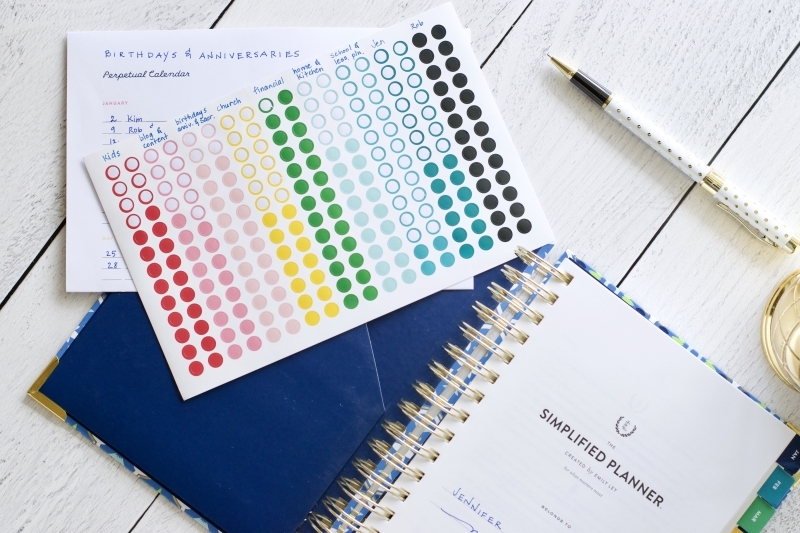 Let’s look through the new 2019/2020 Simplified Planner collection together! 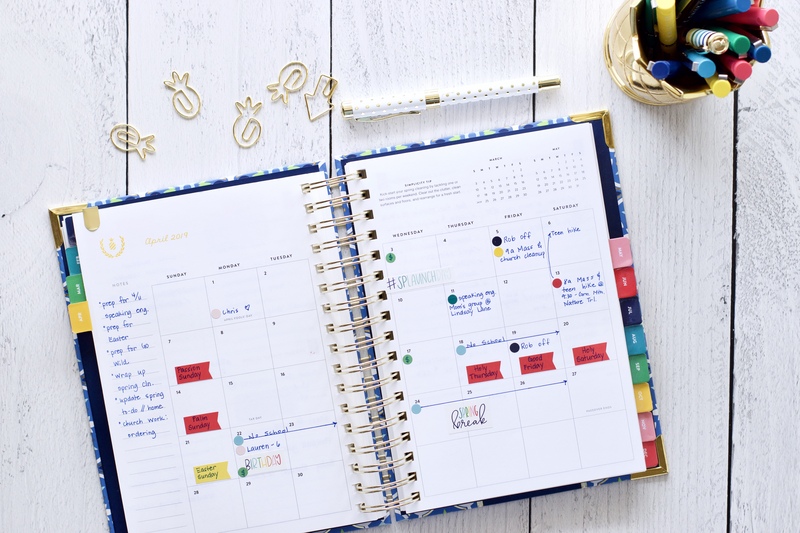 I’ll share my thoughts on the few updates to the planner collection this year, give you a coupon link for $10 off your first Simplified Planner, and I’ll share my favorite accessories that make planning more streamlined and purposeful for me! 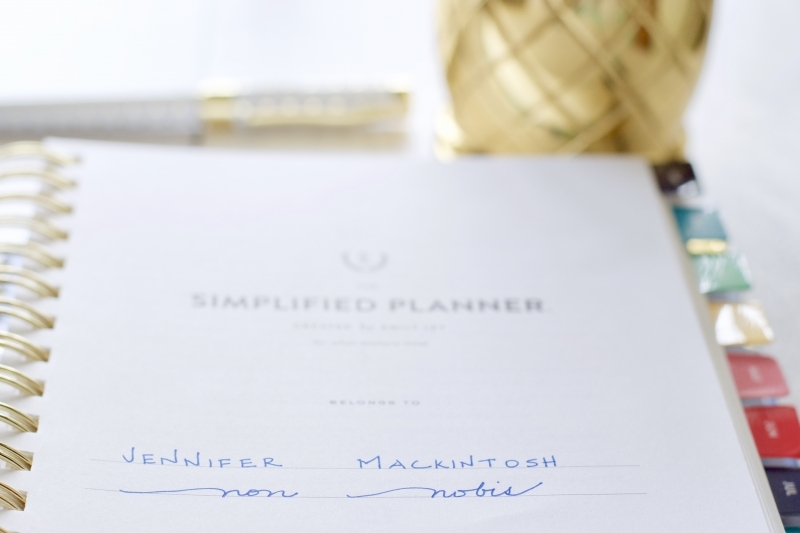 And then, after the review, I’ll show you how I plan in my Simplified Daily Planner, and because so many of you have requested it, I’ll show you how I use my Simplified Weekly Planner as my financial planner! 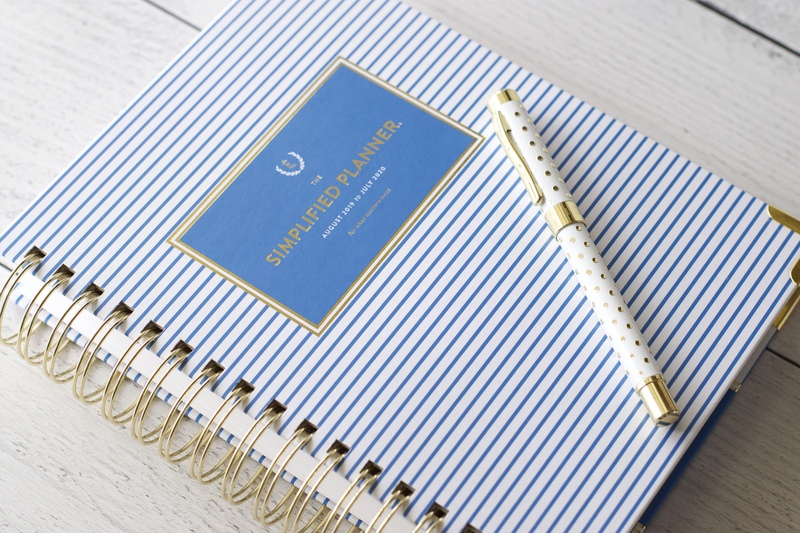 Before I start, I have to thank Emily and the team at Simplified for sending me the (Blue Pinstripe) Daily Planner that I’ll be reviewing in this blog post, and using on my desk for the next year! I absolutely eschew the term “influencer” because it implies a certain power that I disdain and vehemently reject! I’d rather be a friend that shares what works for her, and the beauty she sees in a thing (and that’s all I share about here on my blog!). So, that’s what I’ll be – a friend! I do want to let you know up front that my links are affiliate links – they cost you nothing but I may earn a small commission if you shop using my links and for that, I am so very grateful! I use that income to pay for my blog and social media expenses so that I can share and encourage more with you! Thank you! A word on the photos – some photos here are used with permission from Simplified, but most of the photos here are mine! If you’d like to use a photo (or group of photos) here, please contact me first. To see fine detail you may have to click on the photo to force it to load in full resolution!! 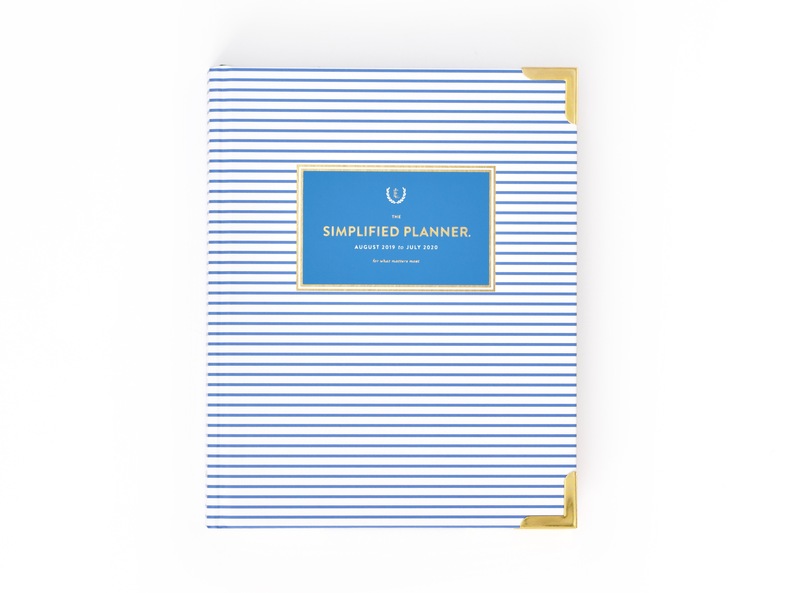 These planners are all academic planners (August 2019 – July 2020) and will release and be available on Simplified’s brand new website on April 3, at 9:00 am Central! So, if you click any of my links before April 3 the products will still reflect a “coming soon” status OR the website may be down in preparation for launch. Don’t worry – all the links will work as soon as the website opens at 9:00 am Central on April 3. The calendar year versions (which will have the same covers but will run Jan – Dec 2020) will be available September 4, 2019 – so check back if you’re a calendar year girl!! Let’s start with the beautiful, new covers! From whimsical and floral to structured and clean, they are all just gorgeous! Who could blame you if you can’t decide which cover design to choose!! For those of us that may be torn and smitten with all.of.them – the ladies at Simplified have come up with a fun quiz to help you decide! The quiz this year is dead-on accurate! I had already chosen blue pinstripe before I saw the quiz, and then I took the quiz and wondered which cover the quiz would suggest for me…and guess what? Blue pinstripe!! Go take the fun quiz! 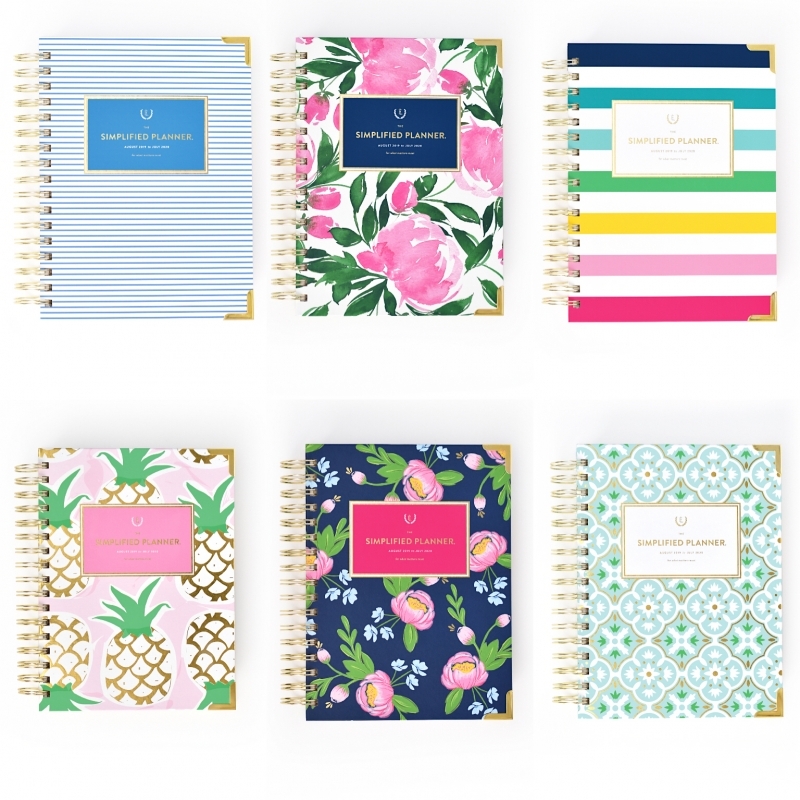 Pictured below are all of the cover designs on weekly planners. Weekly planners are hardbound and smaller than daily planners. This cover is so clean and fresh! I love the structured play of stripes and the cool, saturated azure blue! Hand painted by Jessa Bray, this cover is going to be a fan favorite! It’s so fully of whimsical pink peonies! It’s stunning! A perennial fan-favorite! 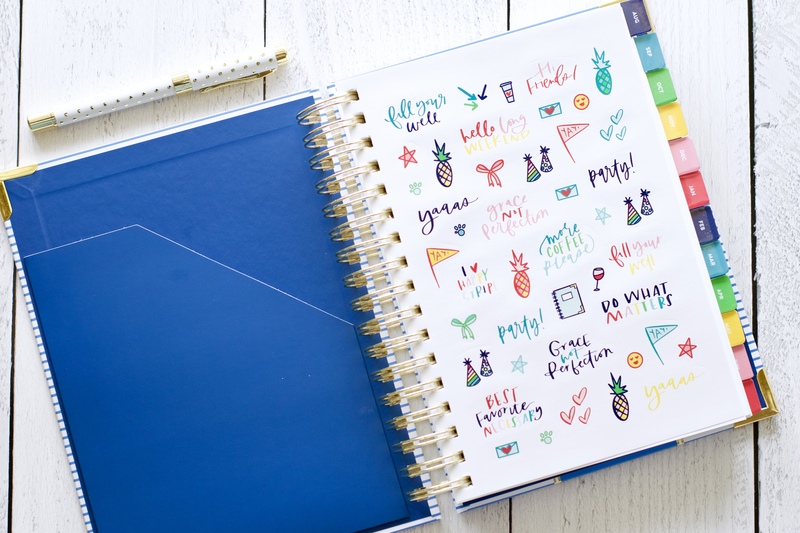 This pattern is the one and only pattern that returns every year as a signature cover containing the entire cheerful color palette of the Simplified Planner! Another beautiful floral cover on a stunning navy background! I love the play between the pinks, soft blues, and greens that pop against the navy! This cover is similar to last year’s mint pineapple cover, a very popular cover design. 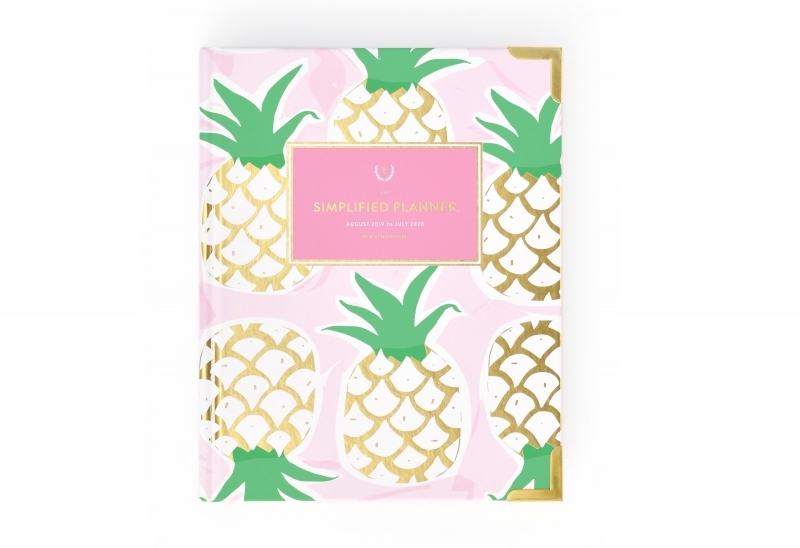 The pineapple shows up in many of the design elements in Simplified’s line, and I love it! The pineapple is the symbol of southern hospitality and this cover oozes feminine charm! Another structured cover that is full of feminine beauty! I love the geometric play with soft colors! 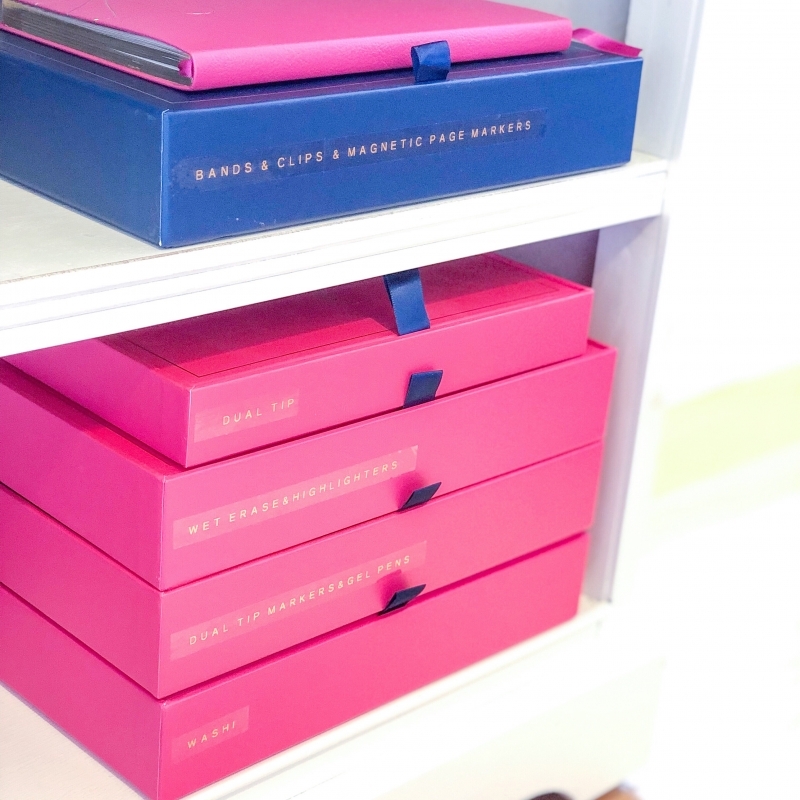 Every planner – whether it is a Daily or a Weekly Planner – comes in a gorgeous navy box! 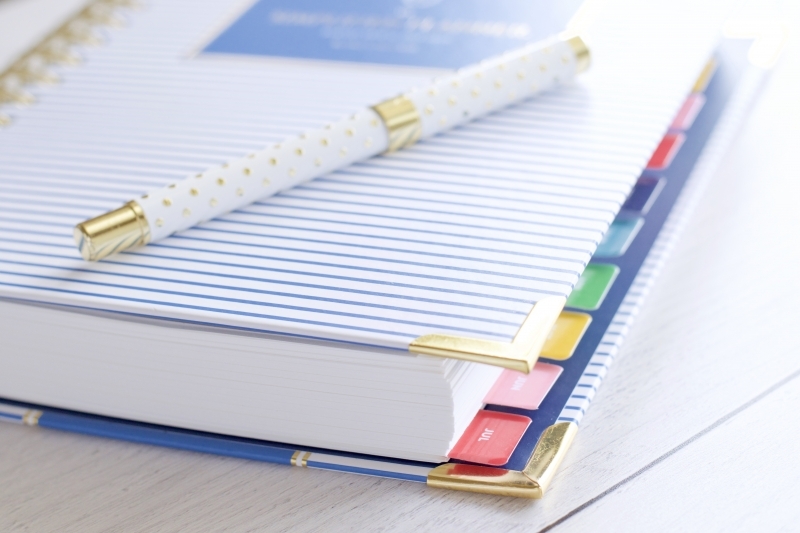 Above you can see each of the covers on the Daily Planners with the beautiful gold coil! 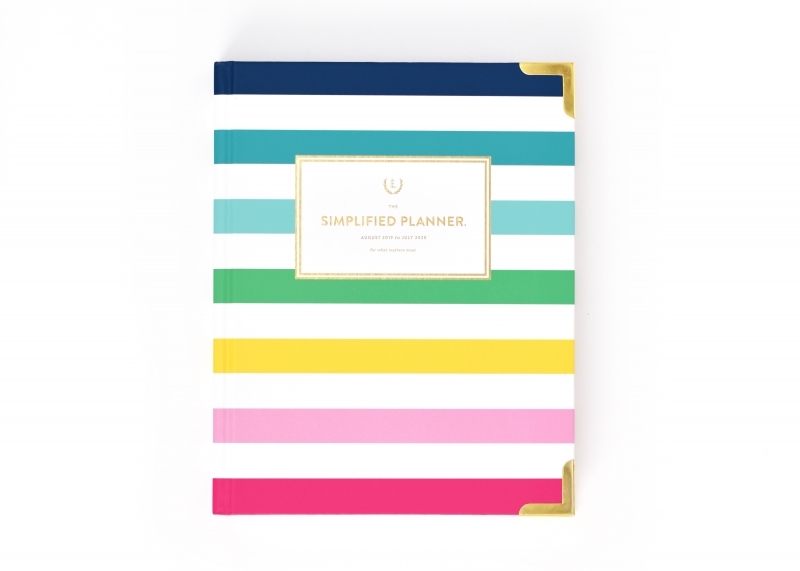 Let’s talk about the Daily Simplified Planner! 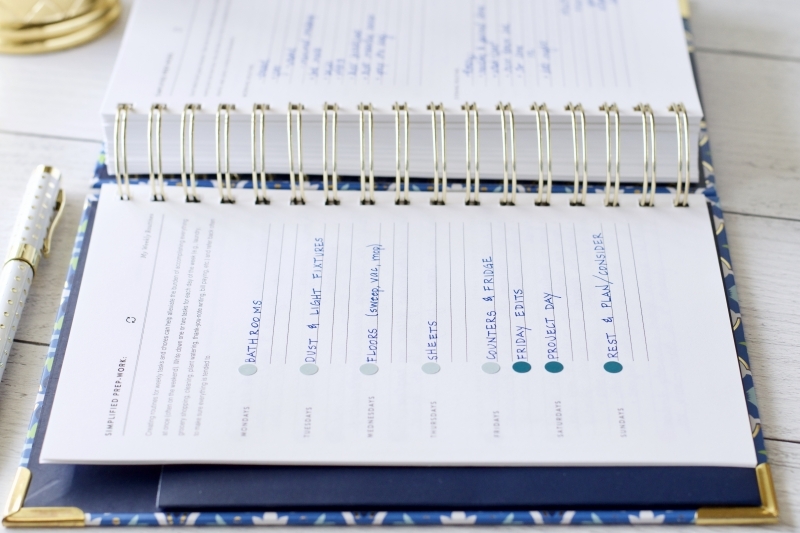 I’m a huge fan of the Daily Planner and it’s what I use. I love that each page is a fresh new start for me! I love having room to list my to do list on one side of the page and manage my time on the left side of the page (more on how I use my planner below!) and still have space so that I can plan for margin in my day! (In some seasons of life, if you don’t plan for margin and free time, it won’t happen. Hello to that season of life!) Don’t discount the Daily if you don’t have a gazillion appointments! Use the left side (with times) to manage your time and time block! 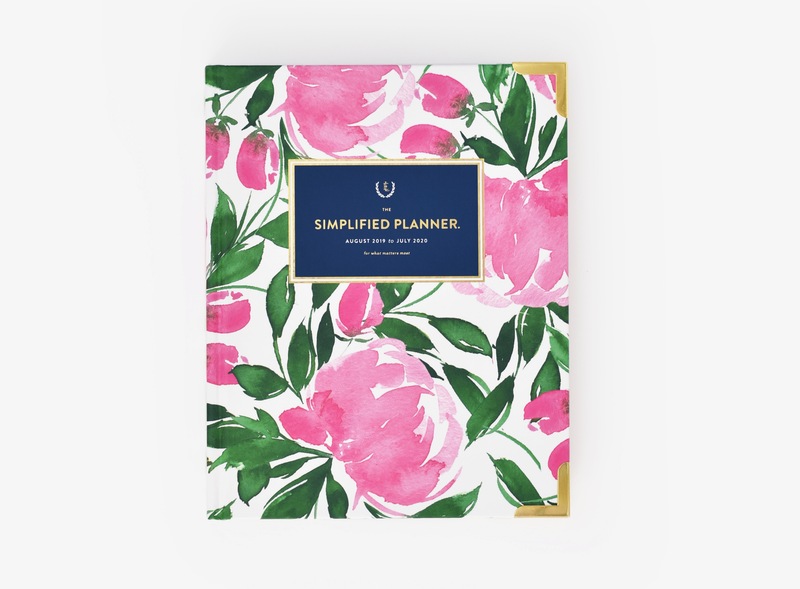 If this is your first Simplified Planner and you purchase through this link (and set up your account) you will get $10 off your planner purchase! In addition to the 4 new notes pages, one more new feature of this year’s planner is SUCH a big deal for me! Each day’s text has a signature color from the Simplified color palette. Mondays are navy; Tuesdays are teal; etc. And Friday’s are back to YELLOW!!! They were orange for a couple of years in order to show up better, but yellow fits the color palette and matches the yellow stickers and flags…and I confess it was a big deal for me! LOL! Welcome back, buttercup yellow! 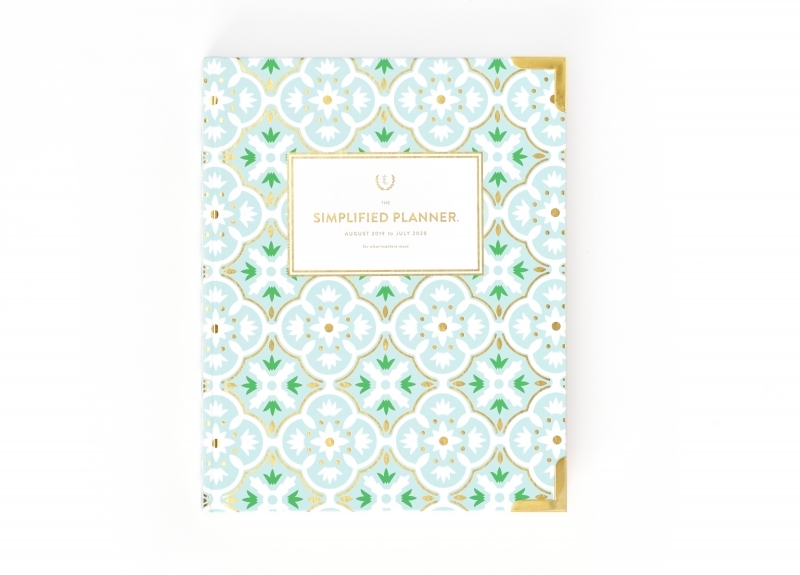 The Weekly Simplified Planner is perfect for those of us that really enjoy seeing an entire week at once! It’s still super functional although a little more streamlined and compact. 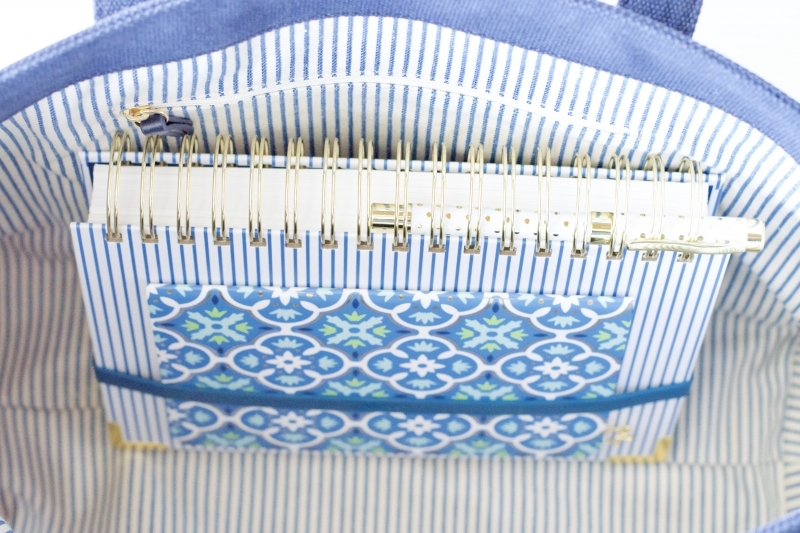 The weekly makes a great planner for throwing in your bag because it is smaller, lighter weight, and its binding makes it super portable! 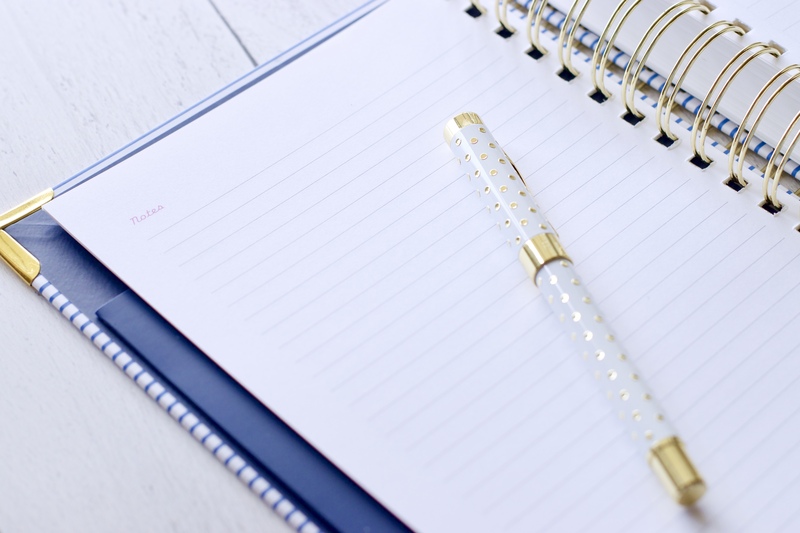 I’ve also found the weekly steps into some specific planning roles that I have – for example, I’m using a weekly this year to manage my finances and budget goals – keep reading if you’d like to see how I use it! Lay-flat book binding – and yes, it really does lay flat! The big change in the weekly this year is that the menu box which used to be at the bottom of the checklist column for each day is now gone, leaving you more space to add to your to do lists! 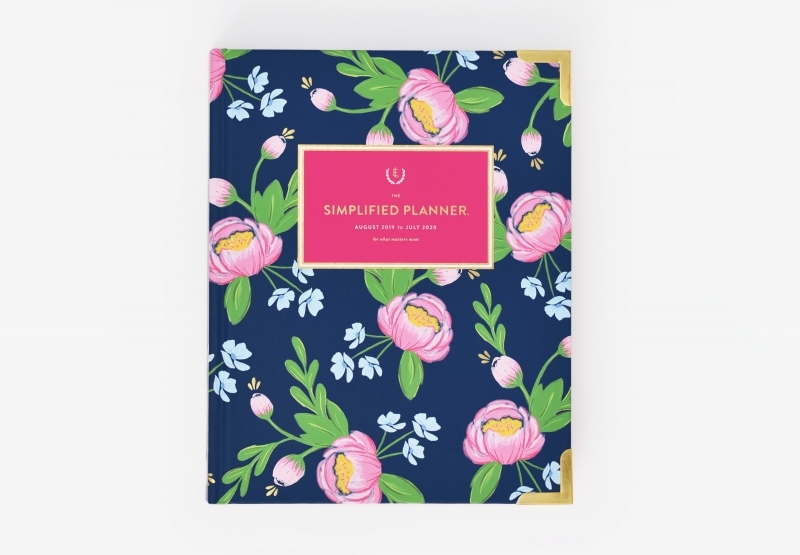 I don’t use much with my Simplified Planner because the whole idea is to keep it simple!! Having said that, there are a few accessories that I use a lot! 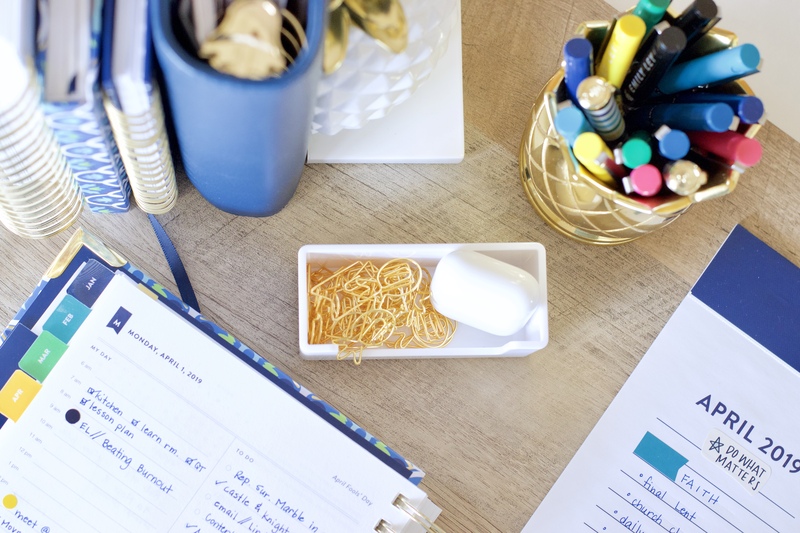 Paper Clips – I use the pineapple clips to mark my place in my planner because the top of the little pineapple sticks up and is easy to see and grab! And I use the other clips to hold invitations, coupons, medical appt. reminders in the appropriate place. 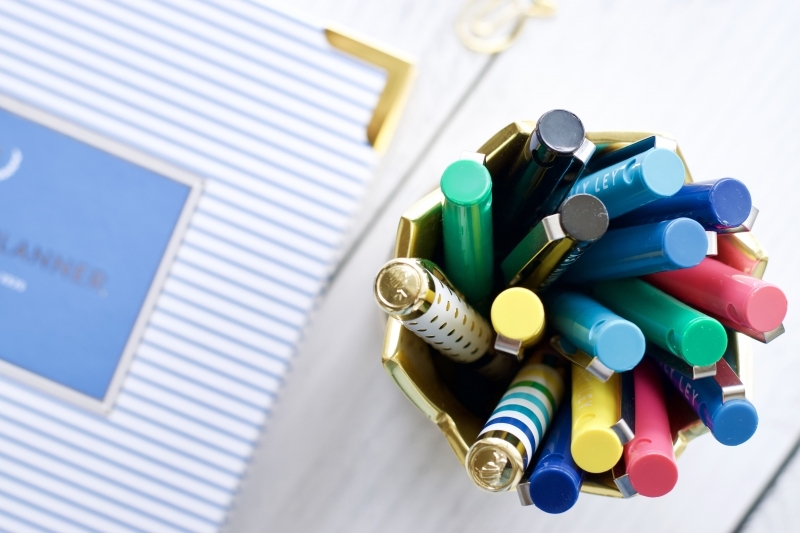 The pens are a favorite of mine, but especially the Happy Stripe pen and the Gold Dot pen. These two pens come with .7 black ink, and I prefer blue. And I just love my Pentel Energel ink in a finer line (super fast drying, always smooth, never gloppy!) so I just replace the ink that comes with the pens with my favorite ink refill on the planet – Pentel Energel .5 blue ink. But for those of you on #teamblack Pentel makes a fabulous black ink refill, too! So…if you were wondering what pen refills fit in these pens – Pentel Energel is my go-to! 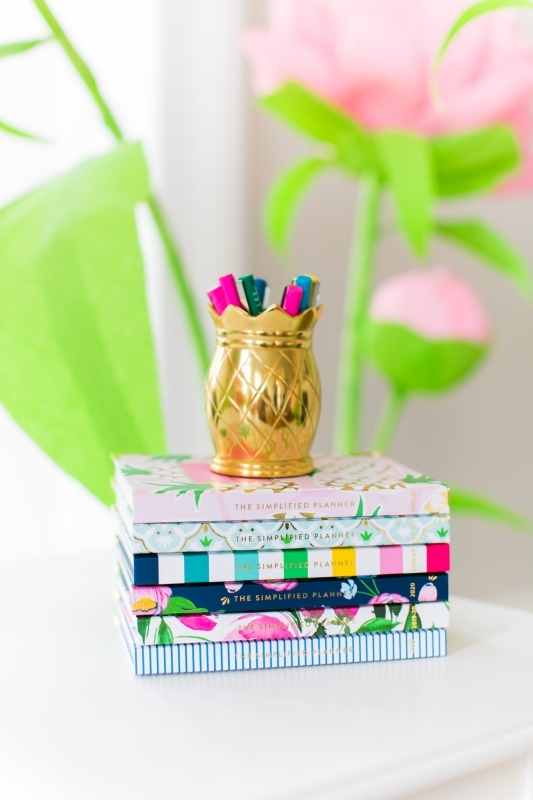 Pineapple Pen Cup – I mean, who doesn’t have a desk that couldn’t use some happy? 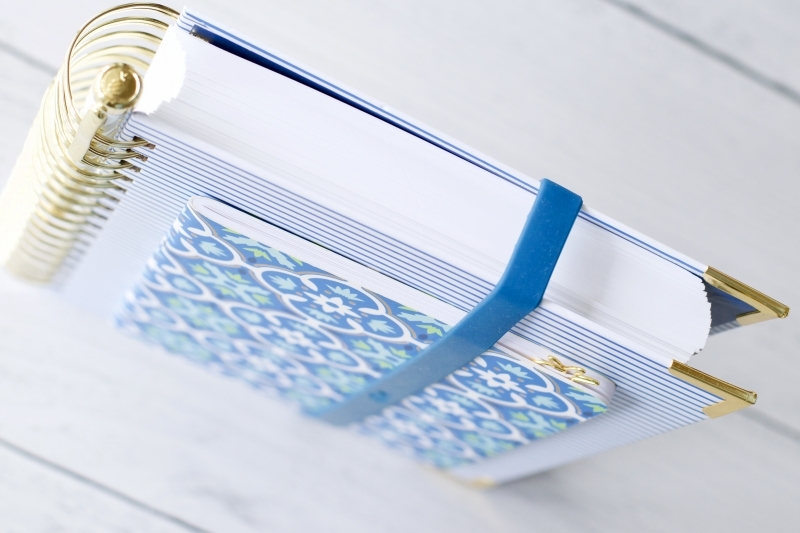 Stretchy Bands – I don’t usually take my planner off my desk, but if I do need it for a meeting, I love wrapping a stretchy band around my planner along with a mini notebook and keeping everything together! Be sure to choose the correct size band – weekly or daily! New Product Alert!!! Sure to be a favorite as soon as I order on launch day are the brand new stickers!!! 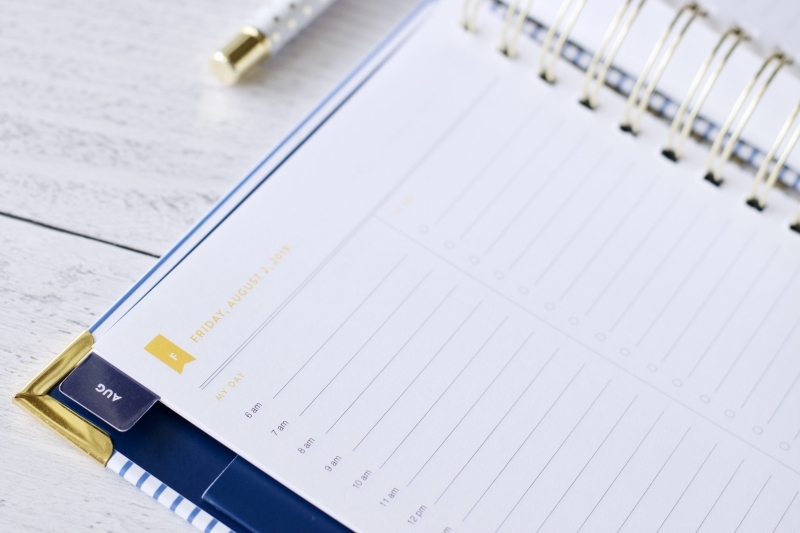 Moving into any planner takes some effort and a little time investment, but this small time investment pays off in the days to come and I consider it an integral part of planning! I start with the perpetual calendar (available for free in the free printable library) and fill in all of the birthdays and anniversaries and big dates for the year! 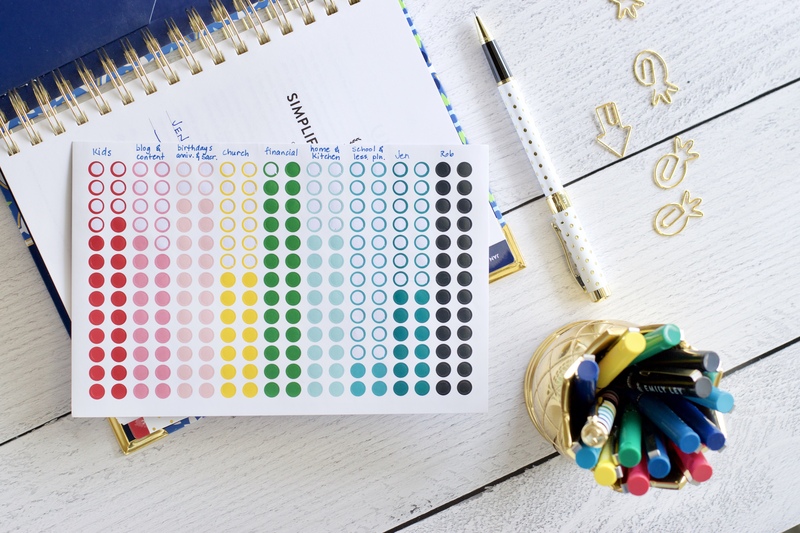 While we’re talking about the free printables – if you’re not sure if this is the right planner for you, or whether you should go with a daily or weekly – go to the free printables and print out the two different layouts. Print out a week’s worth and live on those pages! You should be able to see the best fit before you spend anything, ensuring that your decision is considered and a good fit. Next. The prep work! This was a new addition to the planner last year and I find it so helpful for setting the right tone! The prep work grounds me in reality and gently stretches me forward! Routines are the lifeblood of any home, and their role cannot be overstated! Routines take time to settle into, but they are the avenue in which we love and serve our families, and over time, these routines become a part of the atmosphere of home! They’re so important!! Don’t skip the prep work! Through the year, as I make an appointment or an event pops up through an email or I’m told of an activity, I add it first to my monthly view. This view is populated through the year, almost on its own. Then, at the beginning of a month, I note important liturgical days from the Church calendar, and I note special priorities in the column on the far left. And finally, I pull these events off the monthly page and add them to my daily pages. I do not plan ahead a lot in this planner. I live my days one-day-at-a-time and I plan my days one-at-a-time! Obviously, if I know an appointment exists on a certain day I drop it in there, but my to do lists and my time blocking – it all happens during the day I’m living it. I lay out my time blocking for the day in the morning and the start of my to do list, but it all grows pretty organically through the day. And it works. 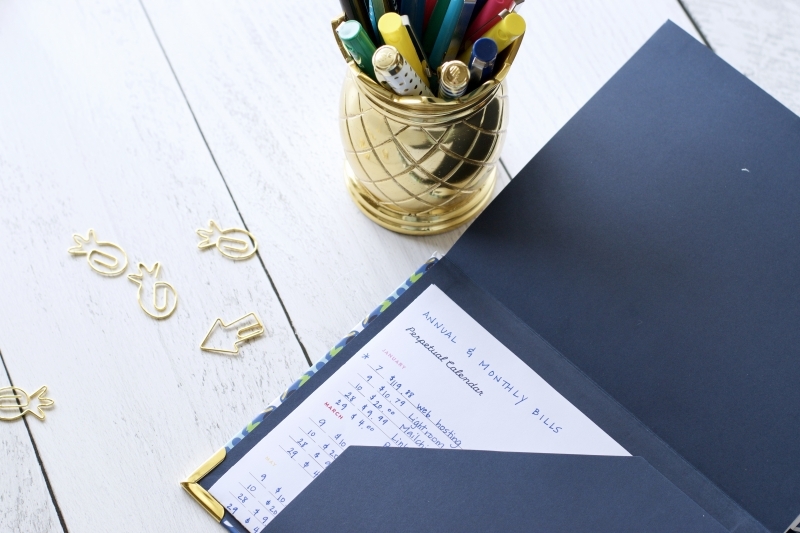 My planner stays out and open in my traffic pattern – and for me, that’s on my desk. If everything gets done – great! And if not, I’ll pull it forward the next day. And flip the page to a clean, fresh start! And that’s it! 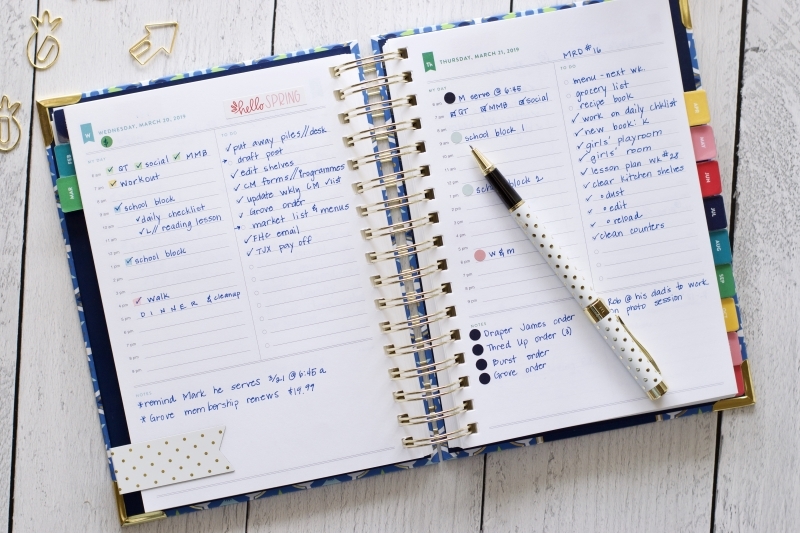 There is no perfect or right way to plan in this planner! Live these pages in a way that fits YOU!! Rob and I are committed to a debt free lifestyle. Most of our income is regular but there are some irregular income sources to manage. Rob manages our family budget – mortgage, insurance, the big bills, and our family savings. He builds an excel spreadsheet that maps out the entire year (because my husband thinks digital…and I…think on paper) and we print it and review it together – income, bills, sinking funds, savings – all of it. And we live it. Part of our excel spreadsheet is this little (it’s actually big!) line called, “Jen’s budget” and that’s me and that’s what I manage! I manage all of our household items: groceries, all clothing, home decor, homeschooling, health/wellness, and toiletries – that kinda stuff. Several years ago, we got tired of tripping over each other in our budget and our bank account so we opened a sister account – and that’s what I use. This one change has been a phenomenal help for our budget and our ability to save and manage a variety of sinking funds. The sister account is attached to our main account, but still separate (it has its own debit cards and bank number) so Rob transfers a set amount to that account each payday (the amount which we agreed on at the beginning of the year when we set up our excel spreadsheet budget) and that’s my set budget to manage – everything that has to do with our home and our kids falls under my budget! And THAT is what I’m managing in my weekly planner! I use the perpetual calendar (available in the free printable library) and instead of birthdays, I map out all of my regular expenses. 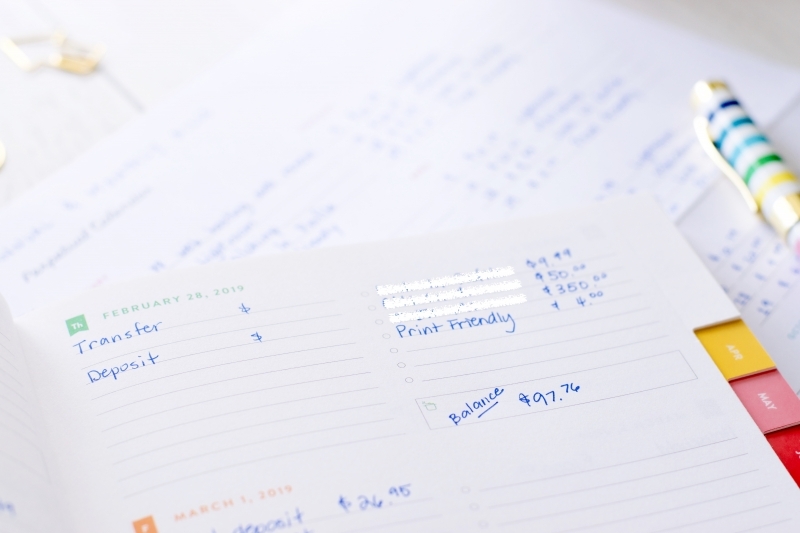 I use the monthly spread to map out those recurring expenses from my perpetual calendar and then I add in regular paydays, and any projected irregular income. 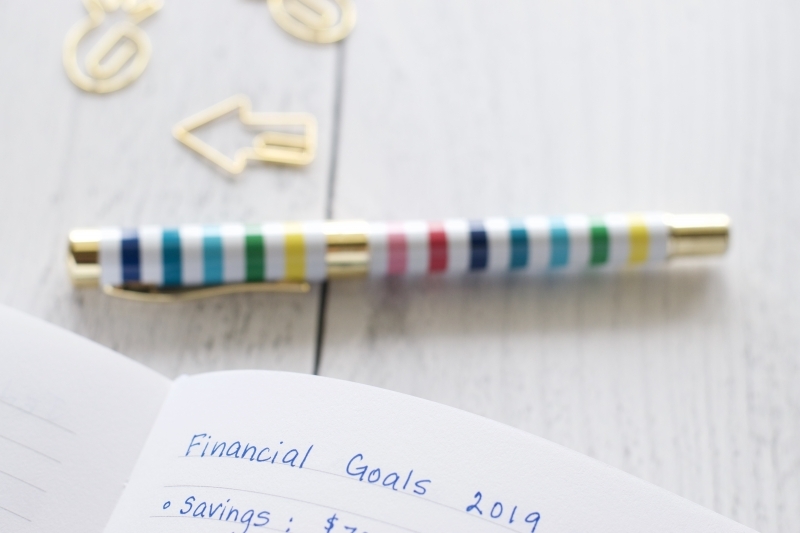 I also note any big savings goals I might have set and bring forward any budgeted items I may have been saving for (like seasonal clothing purchases for the kids). Then, I record all of the daily expenses and income through the week – think of it as a very detailed check register! I use the right column to note expenses and the left column for transfers, deposits, or any sinking fund notes (example: if I make a $50 purchase for a dress for one of my girls, I note it here and also note the new balance in my clothing sinking fund – then in my next monthly, I flip through and update my fund balances. IF…I were managing ALL of our finances I’d handle this differently, but for my needs it works well). In my current planner I use the little box at the bottom of the day to note our balance, but that box has been removed from the new planners so I’ll probably note the balance on the bottom line in my planner next year. I love the notes pages in the back (there are 31) to map our financial goals, any debt payoff plans, big savings goals, big ticket items we might be saving for (hello, new car! ), and any of our financial notes! I also keep a page for each of the kids’ accounts. I start by managing the account for them and showing them how to keep up, then after I’ve modeled it enough, I help them set up their own system. If you are considering a weekly for a financial planner ask yourself how you earn, how you spend, and how you save. Then think of the best way to record and budget for that. 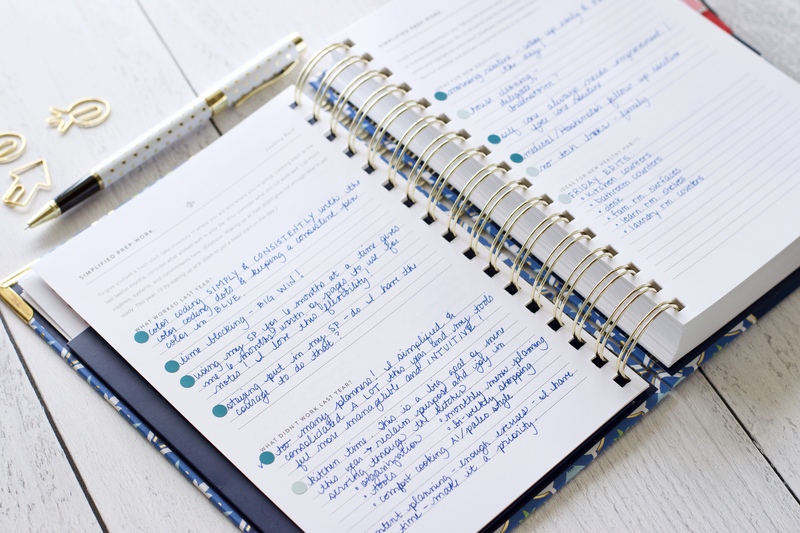 A weekly planner can be a great place to manage financial priorities! 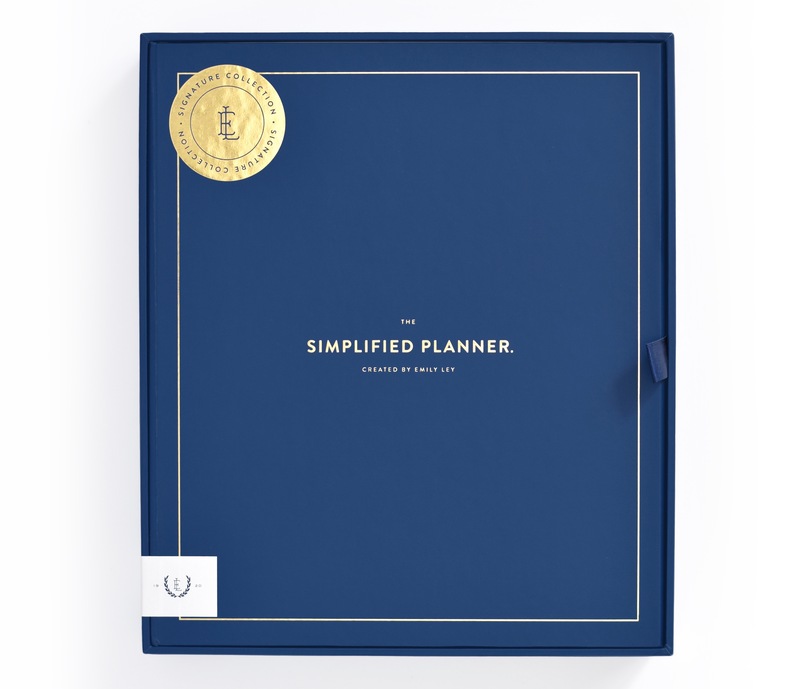 Remember that if this is your first Simplified Planner and you purchase through this link (and set up your account) you will get $10 off your planner purchase! I know this post was long, but anytime we consider investing a solid amount of financial resources in a planner tool it’s helpful to see details and examples – not to imitate, but to filter through your own season and needs so that you have workable ideas to apply! To help with your inspiration, be sure to check out the amazing video library at Simplified! PURE GOLD!!!!!! All free, and all so helpful and tactical and informative! I really appreciated your blog post I’m new to the simplified planner and through this post I have learned more about what they stand for its good to know that I’ve picked a planner that fits me. I’m so glad I found you on Instagram and that I’ve found a great blog to read. Thanks again. Jen, this is a lovely post! Thank you for sharing! I always look forward to seeing one of your posts pop up in my inbox! This one was so beautiful, inspiring and practical – thank you!! Oh, thank you! I am so glad you enjoyed it! Jen, I always so enjoy your planner usage posts. Thank you so much for your time and effort in writing and illustrating them. (Mind, you, I love your blog in general — long time reader here!). This was a great planner review! 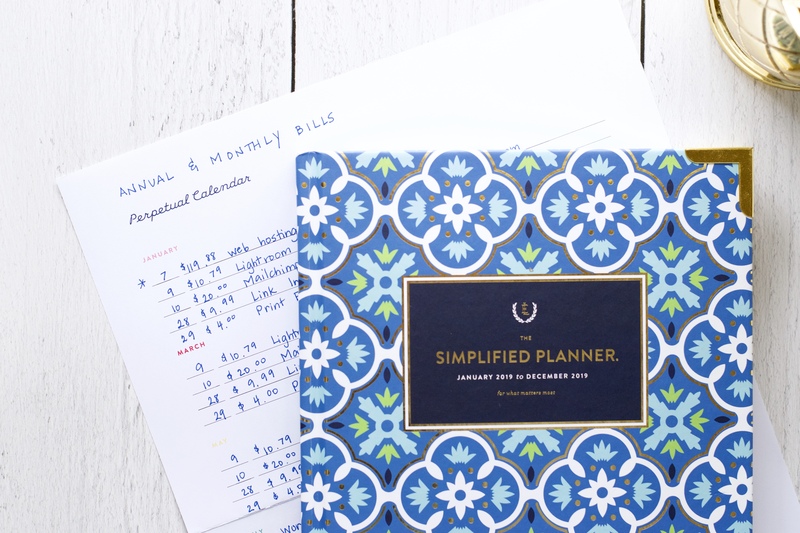 I love the Simplified Planner and was thinking how and why would I need 2, daily and weekly! Well, now I know. Love using the weekly as a checkbook register. So smart. Are you able to share any more photos without showing personal information? This is brilliant. 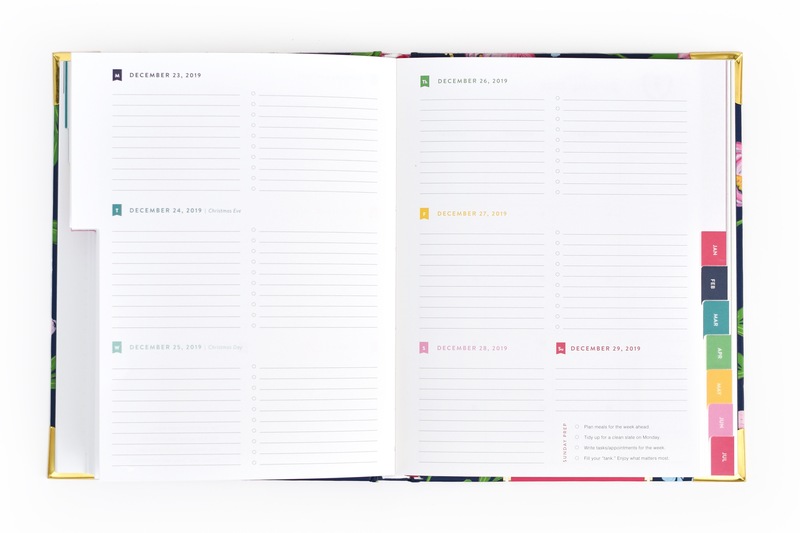 I was wondering specifically about the difference between the Simplified Daily and the Erin Condren weekly planner, which is what I currently use. I can really see now how amazingly efficient this planner is! I LOVE the layout and how each day has so much room! Thanks for the post! !